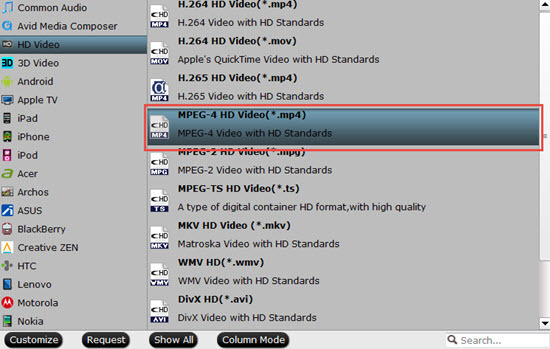 Home » How to Load H.265 (HEVC) Videos to iTunes 12/11 on Windows 8.1? How to Load H.265 (HEVC) Videos to iTunes 12/11 on Windows 8.1? At present, the hottest codec must be the H.265/HEVC, which has already occupied a large part of the codec market. For users, it is great to enjoy the better video quality of H.265 while only with half of file size, which totally free the local disk space and not drop down the quality. In order to enjoy the H.265/HEVC movies, some users would like to use iTunes to manage their videos in local on Mac devices, but how can they transfer H.265/HEVC videos into iTunes to watch smoothly on Windows 8.1? May be converting H.265/HEVC to MP4 could be the best solution, do you think so? How to import H.265/HEVC Videos in iTunes 11/12 on Windows 8.1? Download this H.265/HEVC to iTunes Converter, and run it quickly. There is no virus or unnecessary bundle apps in it . Go to the top of this app , click "File">"Add Video/Audio" to load your H.265/HEVC videos. Or "Add from folder", drag-and-drop , both are easy to go. As we can see from here, the supported formats are MP3,AIFF,WAV,MPEG-4,AAC and Apple Lossless (m4a). So we choose "HD Video">"MPEG-4 HD Video (*.mp4)" as the best compatible format. 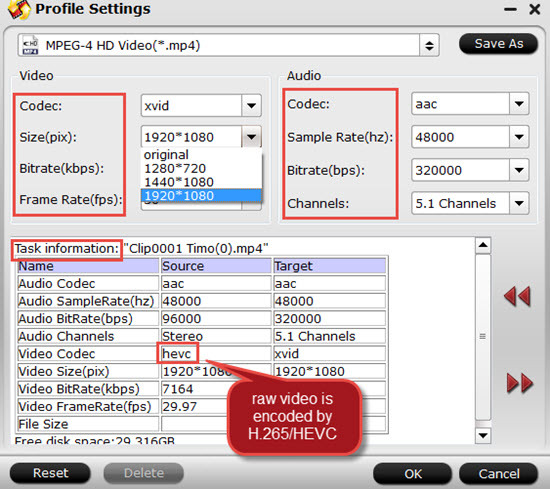 If you would like to keep the best quality of the raw H.265/HEVC videos, then I suggest to choose "H.264 HD Video (*mp4)" in the "HD Video" option. 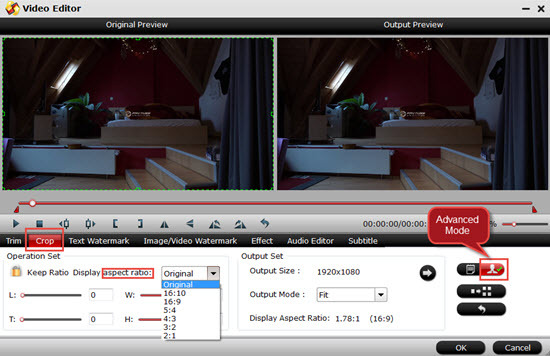 All the format encoded by H.264 in this option will be outputted as H.264 high profile. This format will keep the best quality of your raw videos while compatible on different play platforms. If you want to enjoy your videos on different portable devices ,like Samsung Galaxy Tab, Windows Surface, Android Smartphone, you can adjust your Bit rate , Frame rate or Audio Channels to fit them , so that you can stream to them with iTunes and playback flawlessly. Until now, you can just back to the main UI and start your conversion, but if you would like to make your videos more unique, then with the build-in editor, you can realize this goal. Trim, crop to get the part you want, add subtitles and watermark to protect copyright, under the "Advanced Mode", aspect ratio can be adjusted to fit your player well. After all have been settled, back to the main UI and then click this "Convert" to start your conversion. 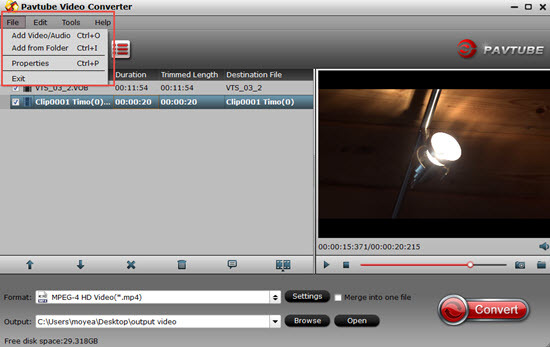 This Video Converter can run on latest Windows 8.1 without any lagging off. 1.If your H.265 videos came from Samsung NX 1, which may be the hottest 4K camera at present, you can still know how to handle those files so that to playback on your PC or Tab. 2.How to transfer files into iTunes can be found here. 3.If you can’t load your MP4/MPEG files into iTunes, click here to see the solution.